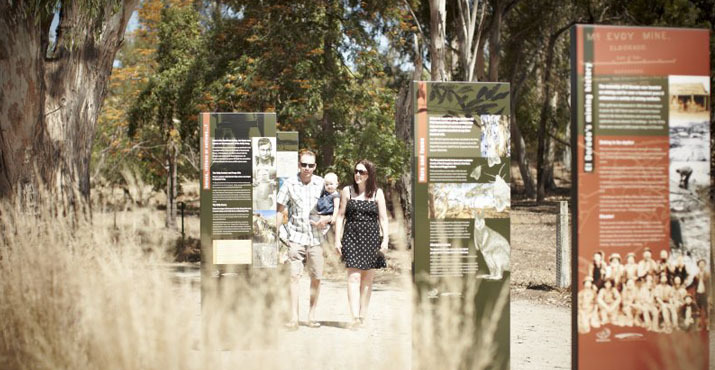 Whilst the Woolshed Valley had spawned a chain of gold rush towns during the 1850s and 60s. It sprang to new life with the Kelly Outbreak in 1878. Joe Byrne, lieutenant of the Kelly Gang, lived in Sebastopol and had attended the Woolshed School with his lifelong mate, Aaron Sherrett. In a trade-off to save Joe’s life, Aaron helped police stage a series of farcical ‘watch parties’ on the Byrne home from positions which enabled Joe to keep visiting his family. The double game wore down Joe’s belief in his mate and he eventually shot Aaron at Devil’s Elbow on 26 June 1880 as a prelude to the Gang’s Glenrowan campaign. Key sites are the murder scene, The Kelly Cave (briefly used by the Gang after the police killings) and the ‘police caves’ where ‘watch parties’ camped. 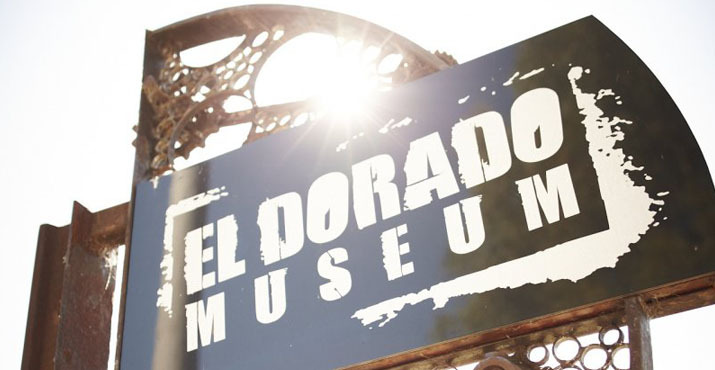 Kelly items are on view at Sebastopol Park (opposite the Byrne homesite) and the Eldorado Museum. Now only a ghost town, Sebastopol Flat was once a place of importance. In 1857, along the four kilometre main street there were 83 businesses, 23 restaurants, a t least eight hotels and a brewery, as well as tent-makers, jewellers, storekeepers, butcher shops, carpenters and watchmakers. The first tin smelter in Victoria was built and operated in Sebastopol. Among the eight hotels, the Hibernia and the Britannia were the most popular. The entertainment was great: three nights a week you could attend a ball and on the other nights there were concerts. The Ashton Circus would visit regularly. Sebastopol Flat is rich in Ned Kelly history. This was the place where Joe Byrne grew up with his friend Aaron Sherritt, and where gang members hid out. Across the distant hills of the valley you can see the Kelly Caves, and on the left, the highest peak is Kelly’s lookout, from where gang members used mirrors to signal other members at Telegraph Rock in Beechworth about police movements. Before the siege at Glenrowan, the Kelly Gang hid in those caves. Joe and Ned would sneak down via a Chinese water race to visit Joe’s mother, who lived in a hut near the creek. Meanwhile the police would spy on Byrne’s hut from a cave two kilometres away, known now as the Police Caves. The Chinese water race is still visible today. At the back of Sebastopol, on the left hand side of Byrne Gully, there is a blind gully where Ned and Joe would alter the brands on horses they had stolen, before selling them in New South Wales. A secret meeting place called London Rock is also located in the area. Near Byrne’s hut a community of Chinese miners settled. Joe formed a close association with the Chinese. He learnt to speak Cantonese and most likely picked up his opium smoking habits from them. It is also believed that the inspiration for his armour may have come from camp fire stories about the leather armour worn by Chinese warriors. On Wednesday 6th of November, 1878 at 4.30 am, 14 police on horses left Beechworth for Sebastopol in the hope of capturing the Kelly Gang. Somewhere along the way the party of police grew to 32, of course they made so much noise no capture took place. Eldorado is nestled on the banks of Reedy Creek (downstream from Beechworth) at the end of Woolshed Valley. A natural ampitheater housing an abundance of flora and fauna opens to the vast flat farmlands that were once swamps and wetlands. The small village of Eldorado is a short drive from several North East towns. 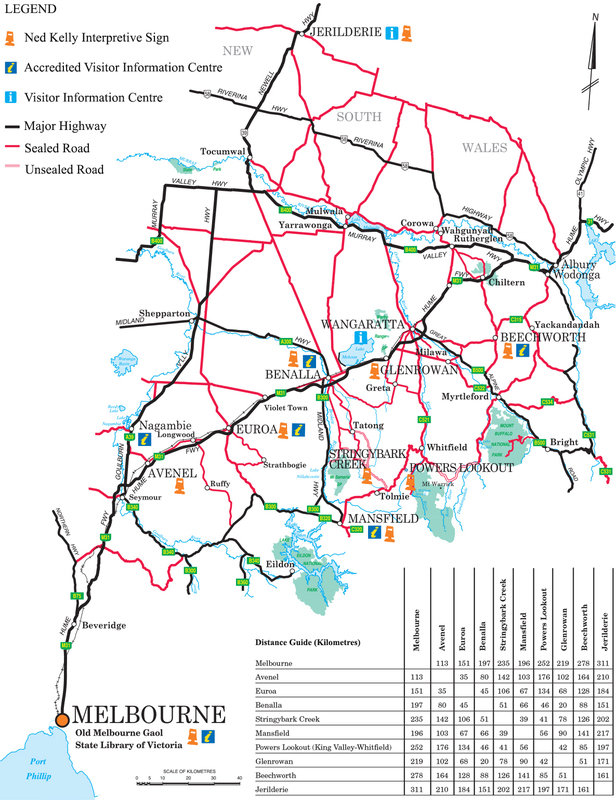 It’s around 15-20 minutes from Wangaratta, Beechworth and Milawa; 25-30 minutes from Glenrowan, Myrtleford, Chiltern and Rutherglen or 45 minutes from Wodonga.